Hi, I’m Megan and I randomly ended up in Louisville, Kentucky, about 15 years ago. Never expecting to stay in this beach-lacking both Southern and Northern city, I have grown to truly love my unexpected home. In September Monogram brought a group of designers, architects and other key individuals to Newport, Rhode Island, to experience the Newport Mansions Wine and Food Festival. Known as the most sophisticated wine and food festival on the East Coast, it has quickly become one of the most anticipated food and wine events in the country. From the minute guests arrived at the elegant Hotel Viking in the Historic Hill neighborhood, they knew the weekend would be truly extraordinary. Prior to the Festival itself, Monogram guests spent a day exploring the lavish and decadent “summer cottages” built in the late 19th century to provide a peaceful respite from the hectic New York City life. The Elms, Rosecliff, and the Isaac Bell House did not disappoint. Global fashion designer and cookbook author Zac Posen joined Monogram guests for an intimate breakfast and cookbook signing Saturday before heading to the Monogram Culinary Stage to prepare some of the delicious dishes from his cookbook with chef emcee Annie B. Copps. And later in the day chef Jon Liddell joined Zac Posen on stage to create refined and delicious pizzas in the Monogram pizza oven. A final celebration dinner at the International Tennis Hall of Fame wrapped up the impressive weekend with sophisticated flair. When the homeowners saw the vaulted frame of the roof for their home addition, they realized the kitchen they were adding would have standard 9-foot ceilings. They wondered if a vaulted ceiling would make the kitchen feel more spacious, so designer Arrington Russell of Restoration Interiors went to work on her plan. The result is a gorgeous kitchen with its “fifth wall” (i.e., the ceiling) vaulted and covered in shiplap and VELUX skylights. The white, mainly transitional style kitchen was featured in an HGTV shoot sponsored by VELUX, and the proud homeowners and designer are delighted. For a kitchen addition, that means it blends well with the rest of the home’s style rather than standing out. “For the kitchen flooring, we also decided to carry the hardwood already running through the home… we didn’t want the kitchen to feel like an afterthought,” said Russell. Bright white elements make this kitchen stand out, especially the subway tiles and tile backsplash feature above the range. And the white shaker style cabinets connect all the pieces across the room cohesively. We totally agree. 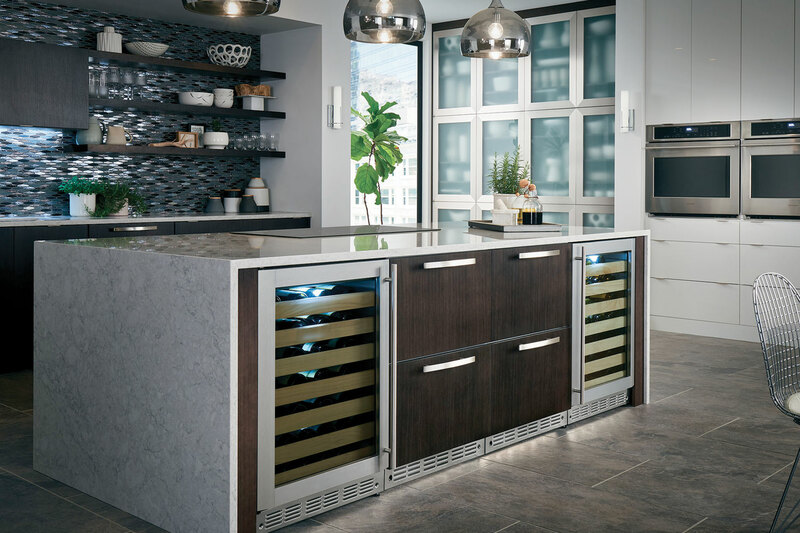 These appliances definitely elevate the look of the kitchen and tie everything together. Kudos to Arrington Russell, Restoration Interiors, and the homeowners on a beautifully designed kitchen space. A practical family kitchen must fulfill many roles while remaining functional as a cooking and food storage area. For one Syosset, New York family, it was important to balance an elegant look with its functional design. Ellen Lopez with El Design Studio learned about the family and their needs before she created this bright and practical, yet polished kitchen renovation. As a first time parent, the new mother needed a transitional kitchen renovation that met everyone’s needs—including the family dog. She also wanted a luxurious, beautiful space that worked with the rest of her home. “She comes from a creative background, so she had a lot of colorful artwork around the home. She wanted something simple but elegant that didn’t compete with her other colorful décor,” said Lopez. With that in mind, Lopez developed her plan. She created a good rhythm with the cabinetry and an efficient workflow to harmonize with her striking design elements. The result is a work of art—balance and interest blended with functional elements. Having light when and where you need it is extremely important in a family kitchen space. Though a lot of light enters the kitchen from the windows, white cabinets keep the kitchen bright and airy. The addition of pendant lights over the step-up island along with under-cabinet task lighting, glass door cabinet lights, and lights over the sink mean that this space remains cheerful and well-lit no matter the time of day. Lopez said her favorite element of this kitchen is how its crisp whiteness works so well. It is bright and refined, but not uptight. It has its own personality, but doesn’t upstage the art in the rest of the home. Even the paneled Monogram refrigerator blends right into the space with its custom white exterior. On top of the white cabinets sits the gorgeous granite countertops with deep veins of grey, dark charcoal, white and black. To accent the granite, Lopez created a glass mosaic tile detail that sets off the white subway tile backsplash and then frames the pot filler above the Monogram cooktop and oven. The tile flooring remains subtle with its mottled grey coloring that reflects the grey tones in the granite. Tile flooring is easy to clean and stands up well to foot traffic from both pets and people, so it was an obvious choice for this family kitchen. Both Lopez and the home owner love every luxurious detail of this inviting kitchen. Its style, functionality, and Monogram appliances are sure to serve this growing family for many years to come.